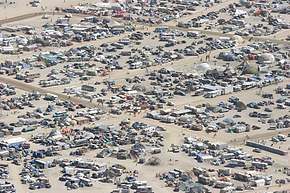 This is past one of the right (2 to 6, approximately) arm of the city. 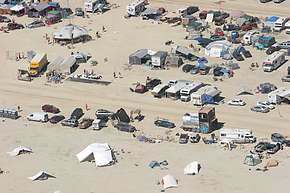 Locations on photos are approximate and may be in error. 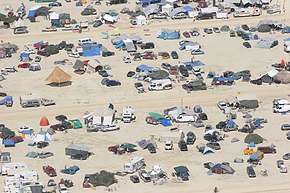 See notes at the bottom for contacting me with better coordinates. 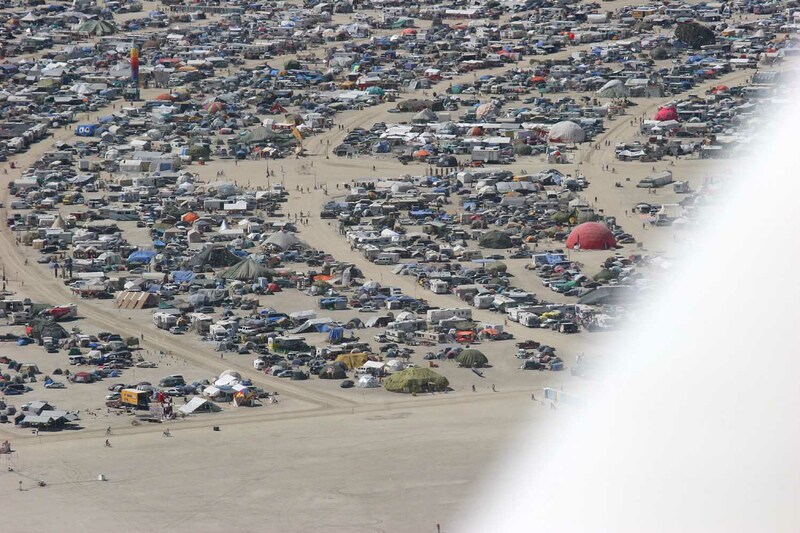 Some shots of your zone may appear in other passes, or even from the other side of the city. Shots are taken through an airplane window and some have lost sharpness. 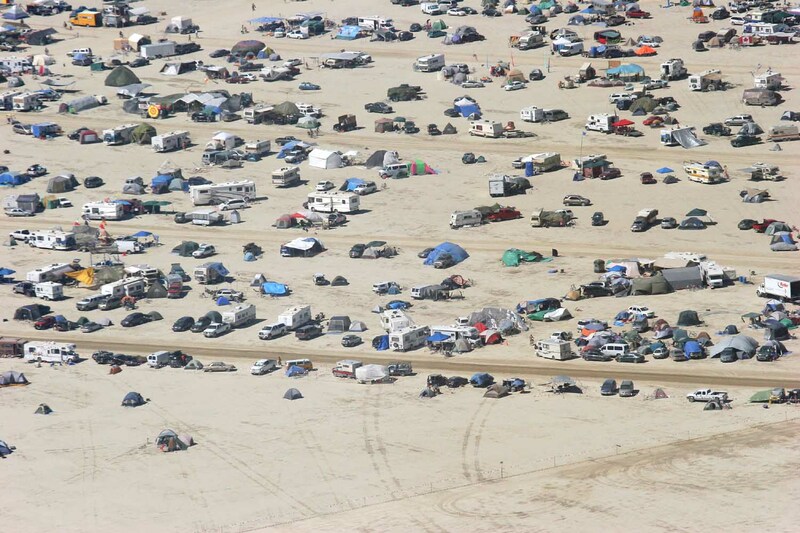 Keep hunting, your tent is in here somewhere! 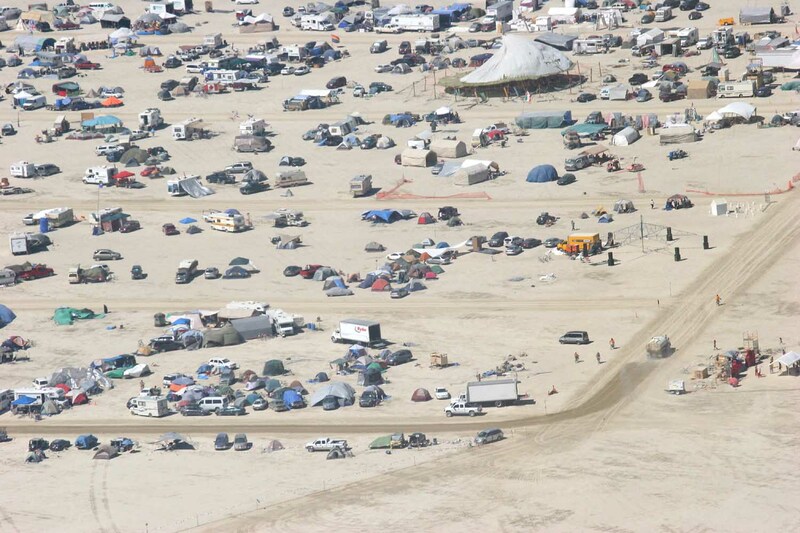 You can annotate these photos, please read the notes before doing so. 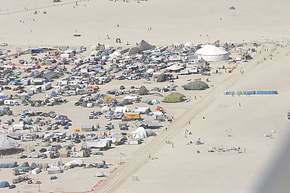 Mark camps, streets and art. These pictures were taken from Halvy's Cessna 172. 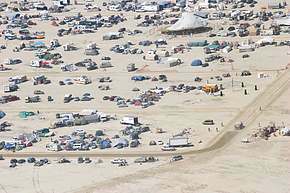 My thanks to him. 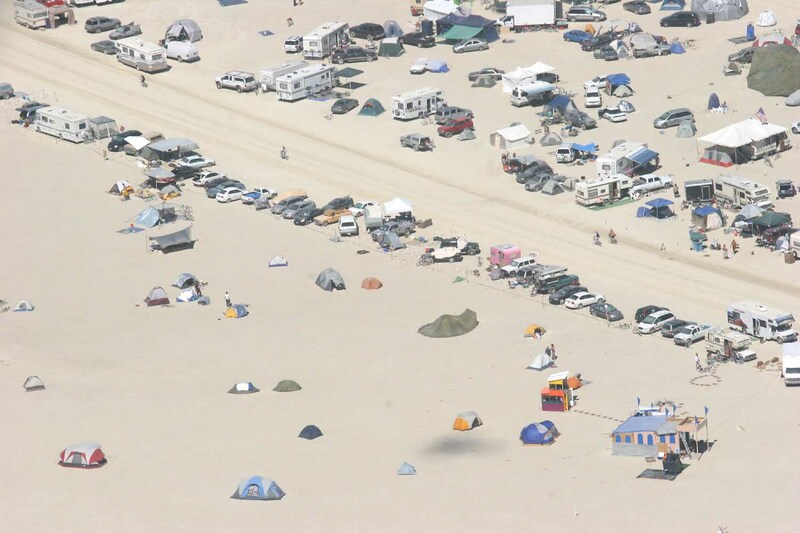 I've done a preliminary pass at trying to place the photos by naming the coordinates close to the center of each photo. 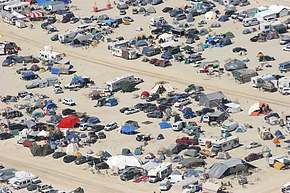 Some of them I have not yet figured out. 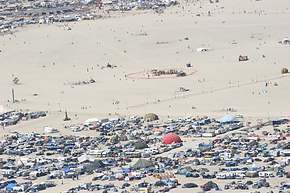 In some cases the coordinates are marked as uncertain. 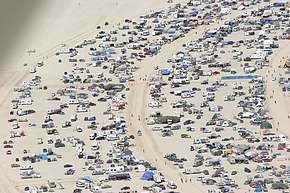 In others they may be wrong. 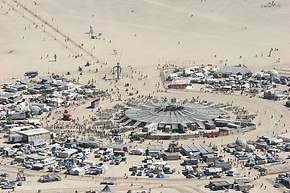 If they are wrong or uncertain, and you know the right coordinates, please mail me at btm@templetons.com (You will get a spam challenge.) 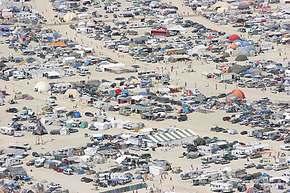 Annotate the picture to label a street or coordinate near the center of it, and then E-mail me the URL so I can correc the caption. 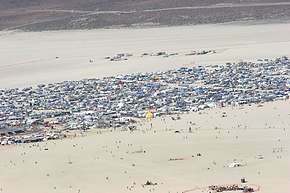 You can also annotate the photos, Flickr style. 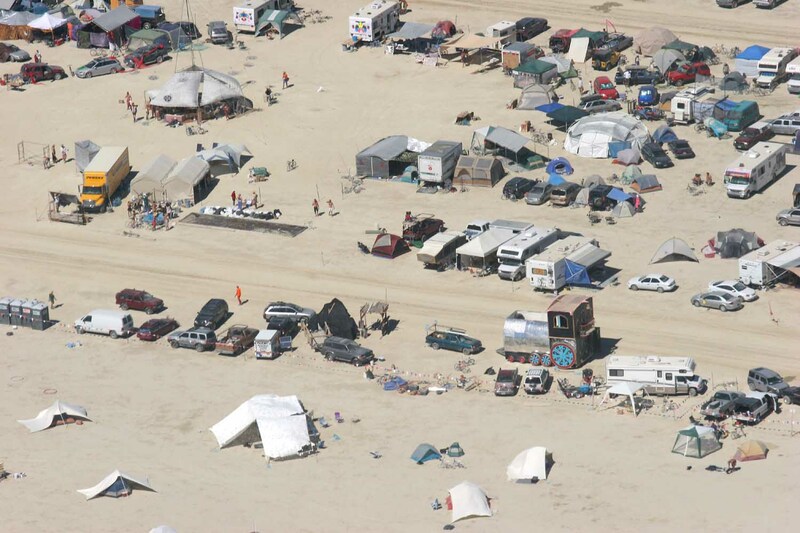 Click on "Add note" and move the rectangle to the street or camp you have identified. 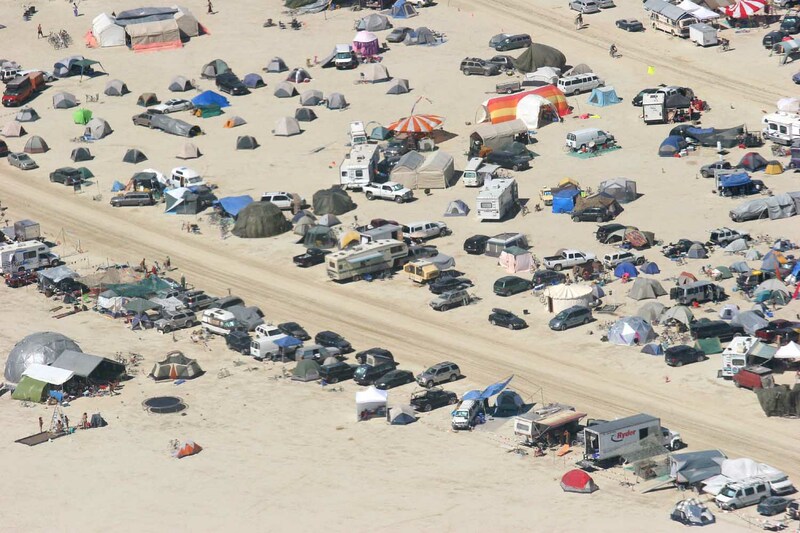 Play nice. 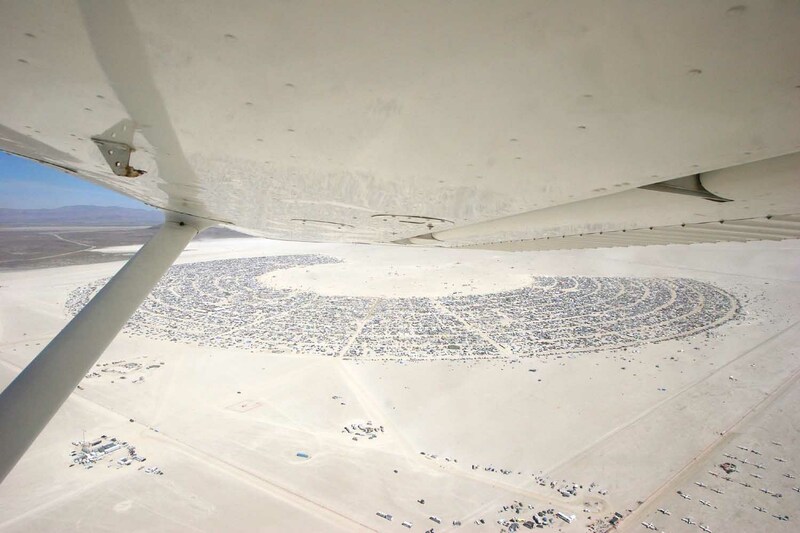 Note that these photos were taken from behind a curved plane window. 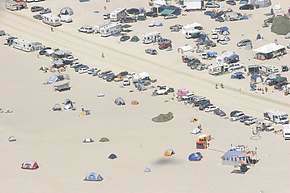 As such, not all of them turned out, and even some of the ones included here have blurring or distortion in parts of them. 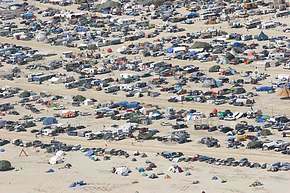 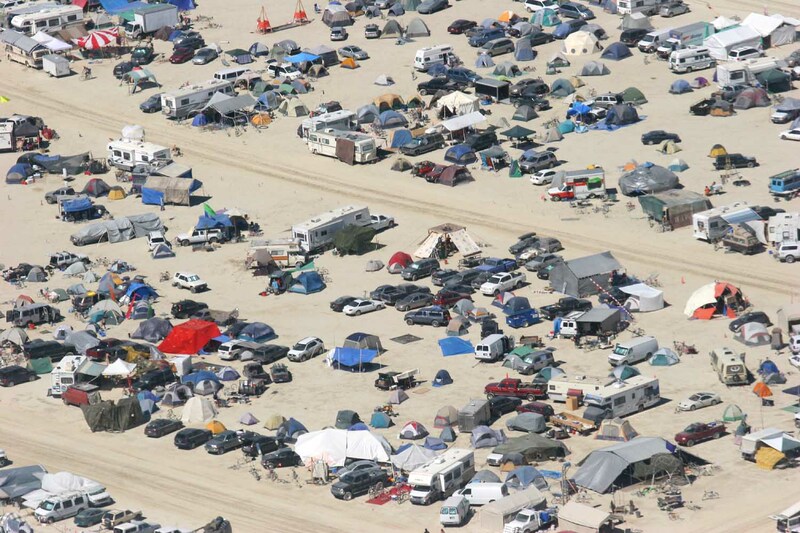 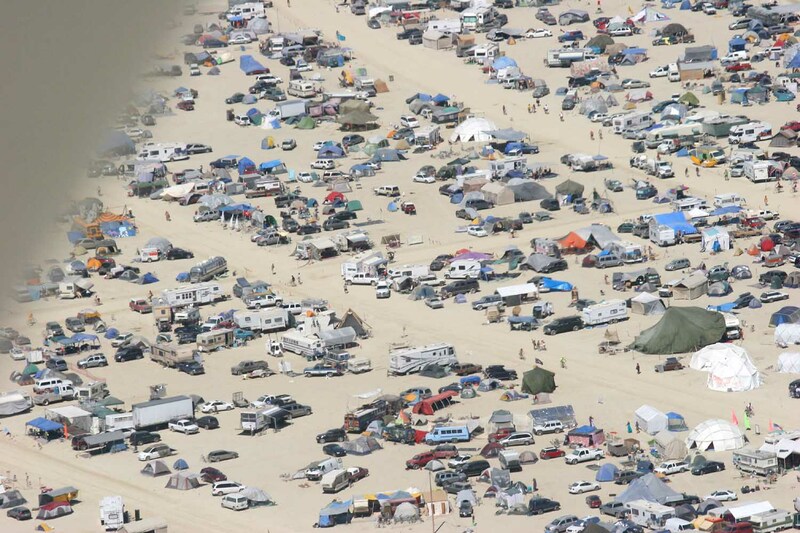 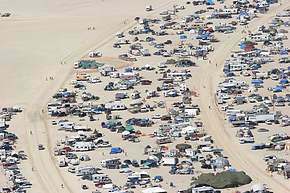 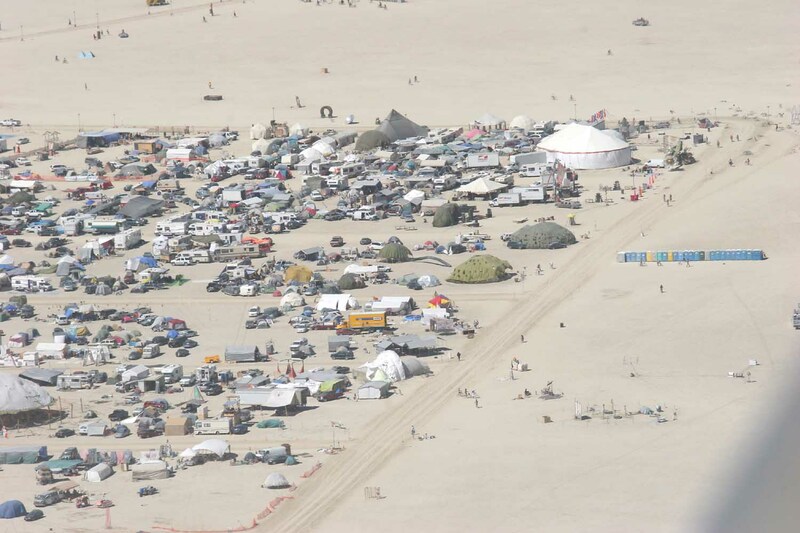 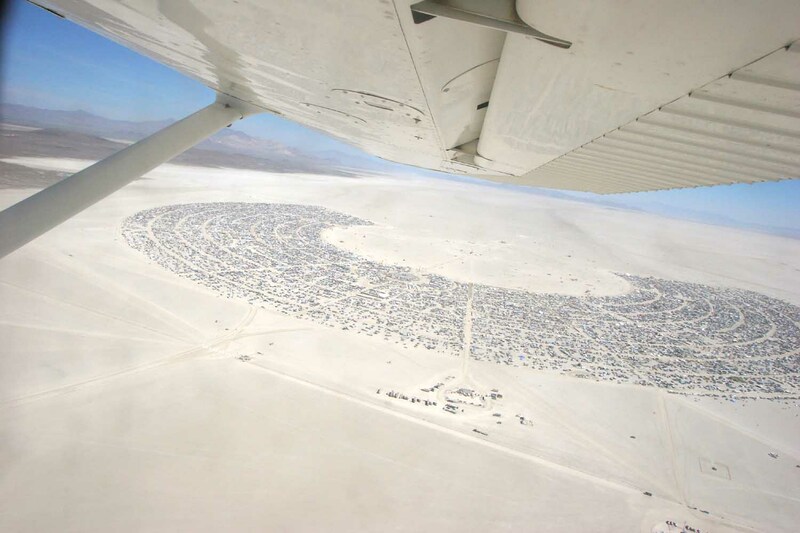 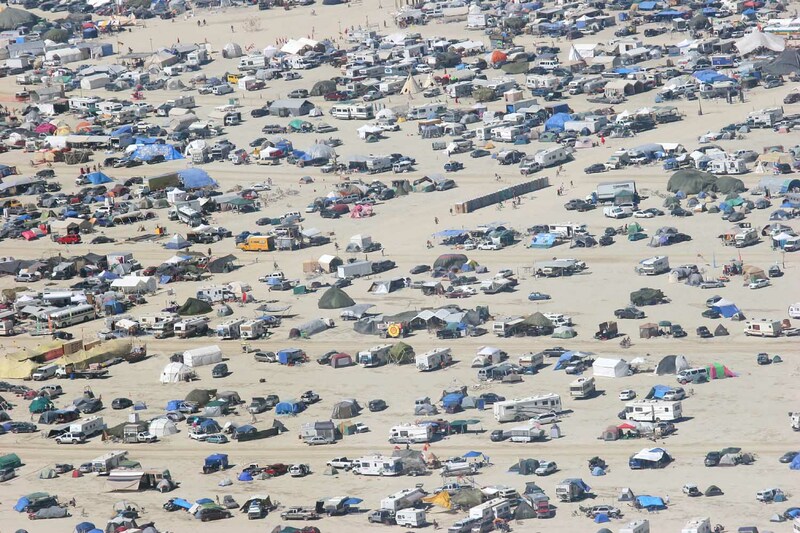 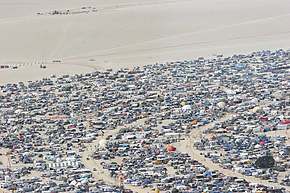 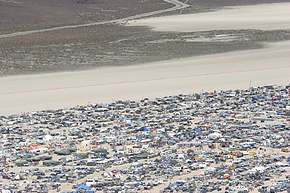 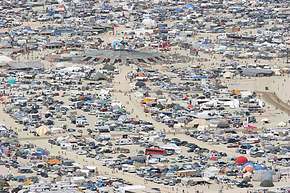 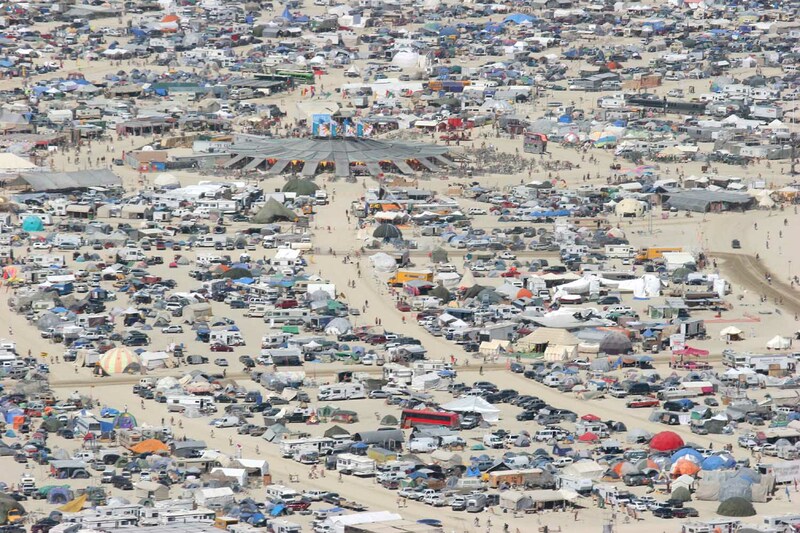 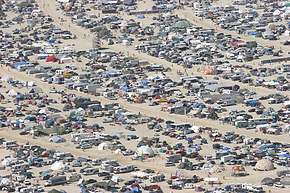 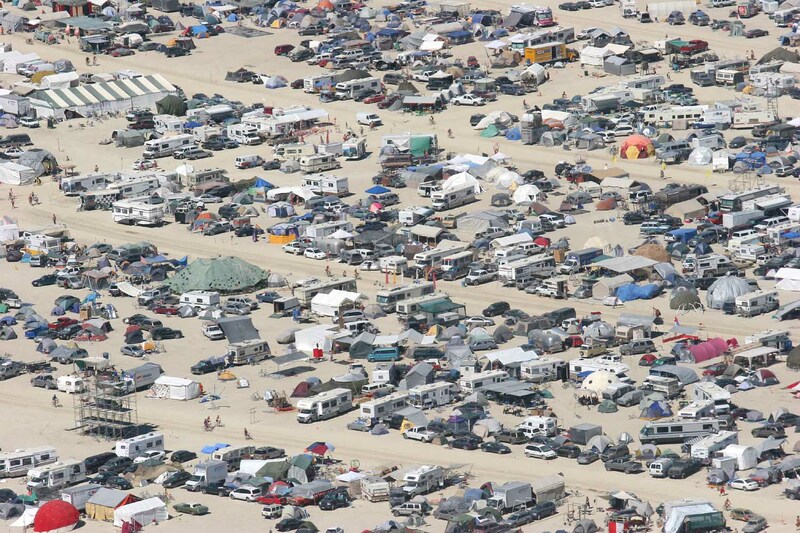 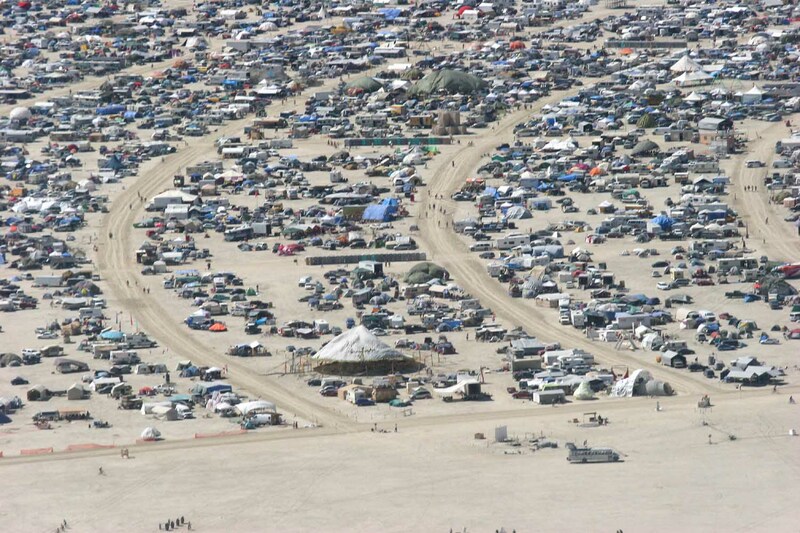 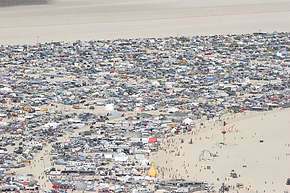 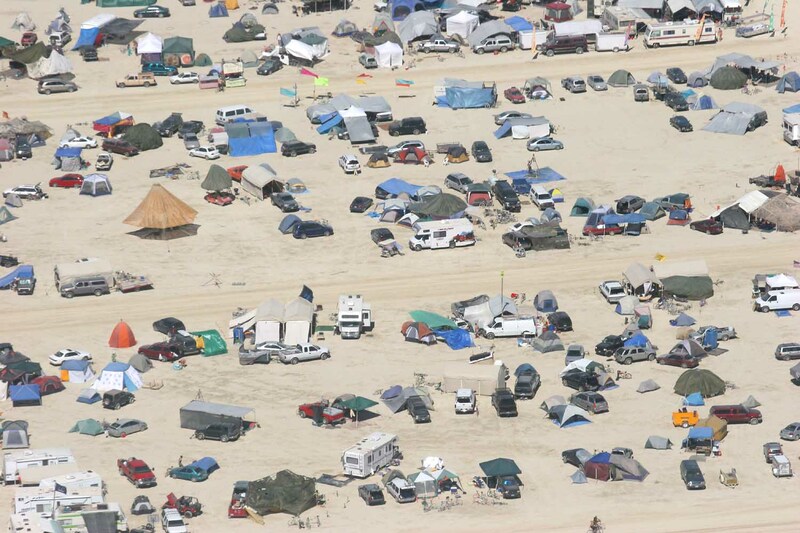 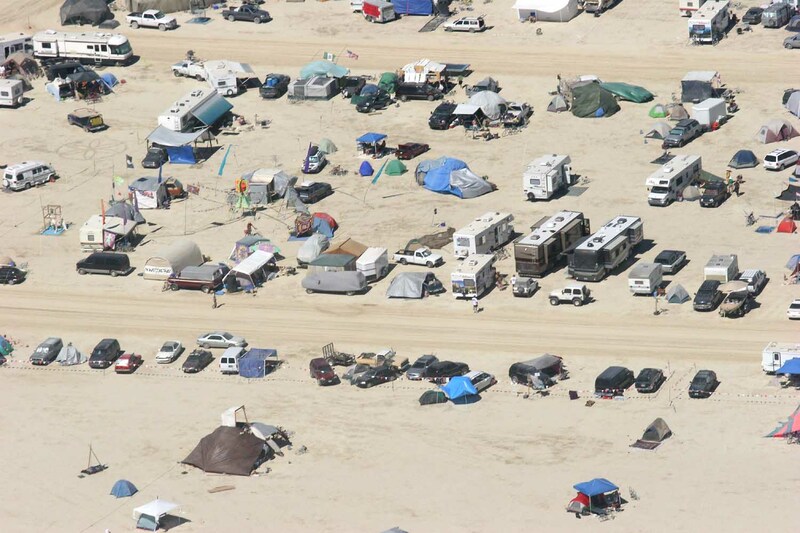 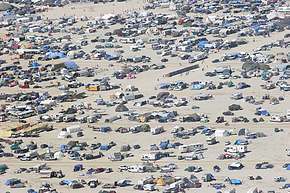 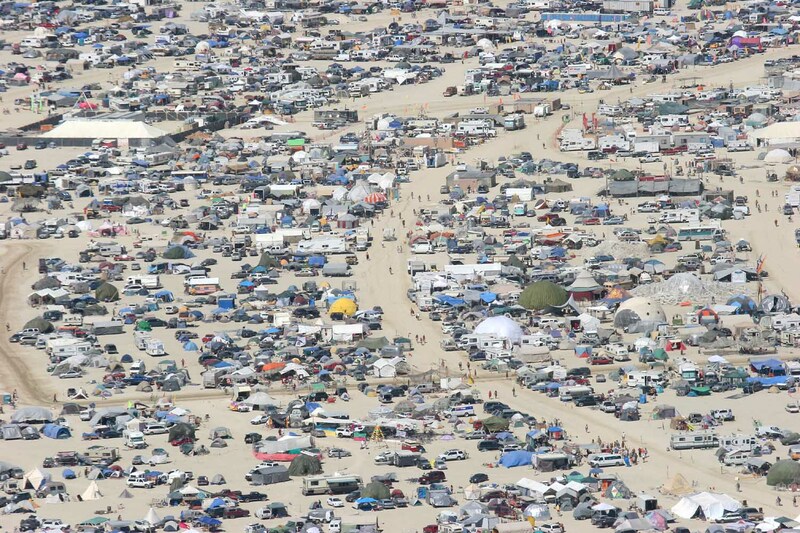 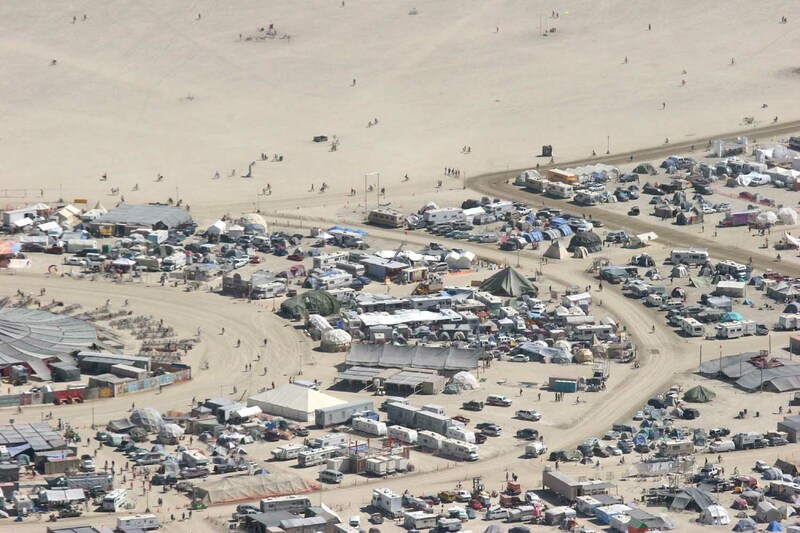 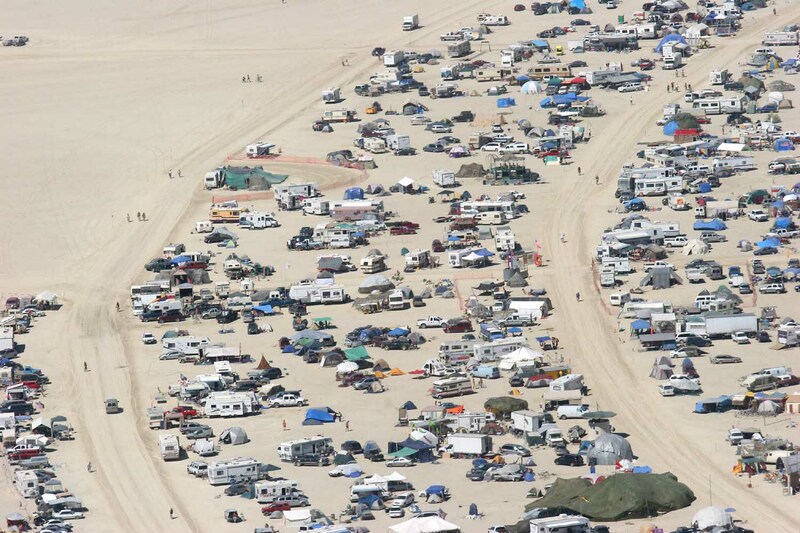 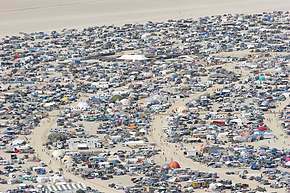 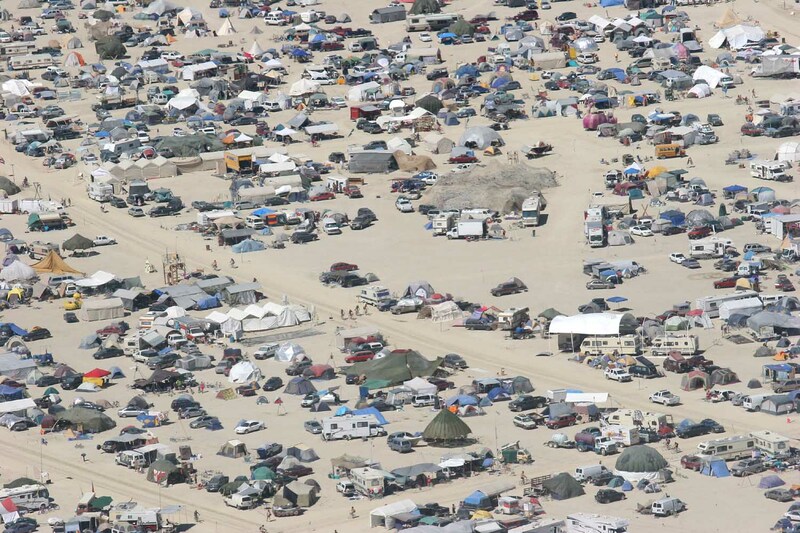 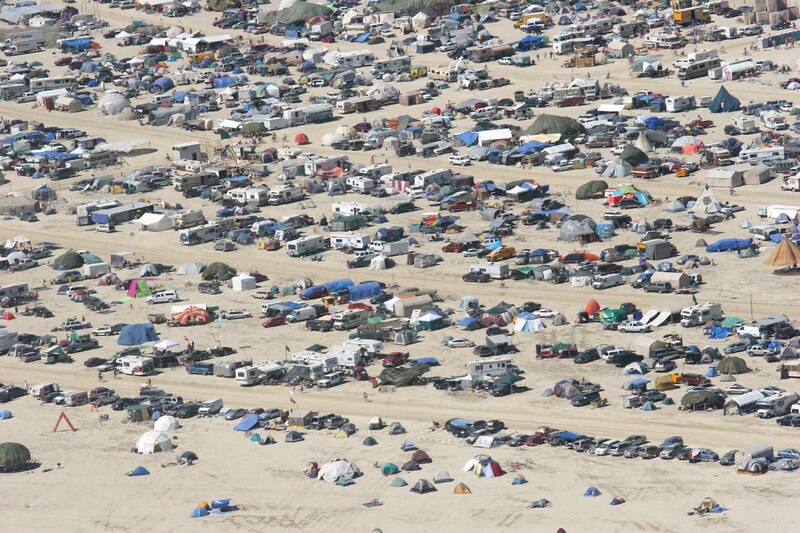 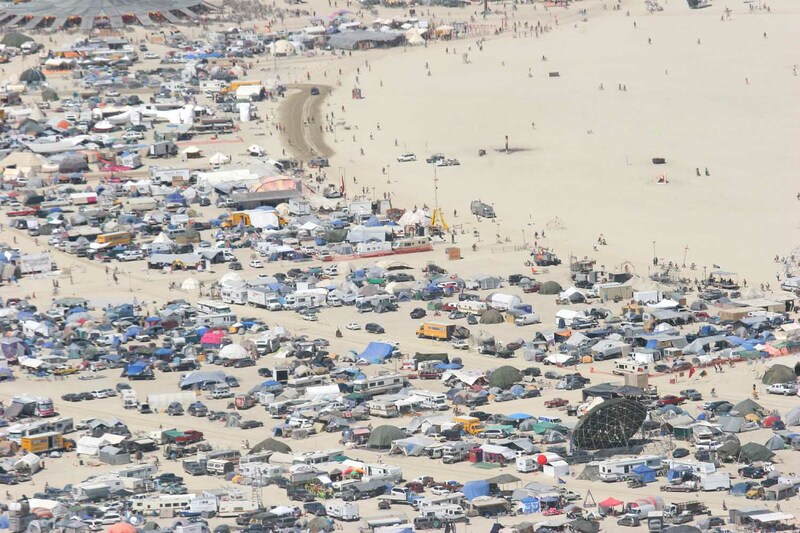 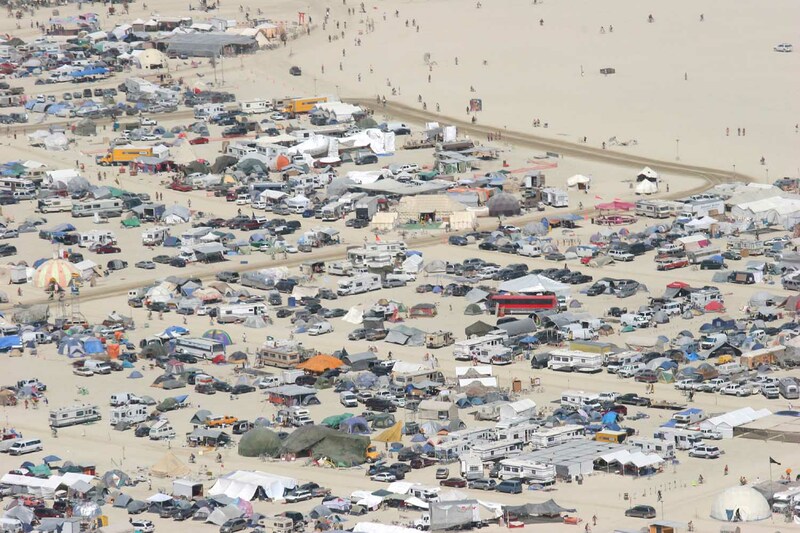 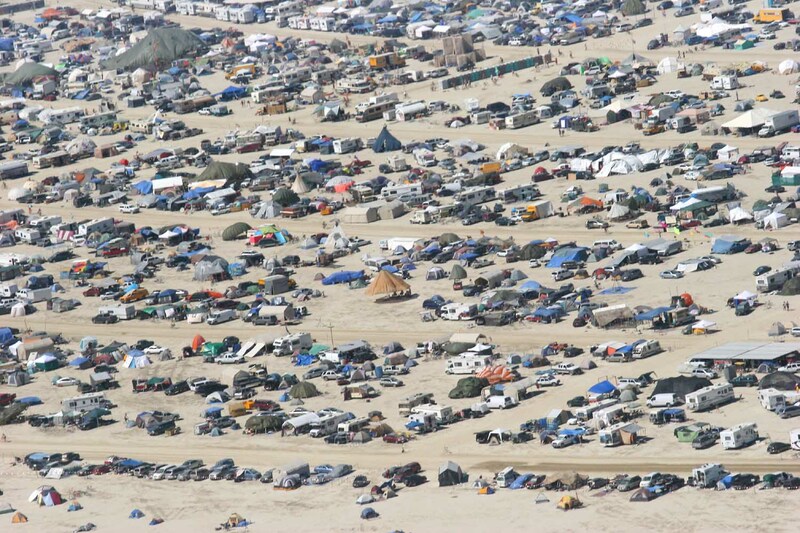 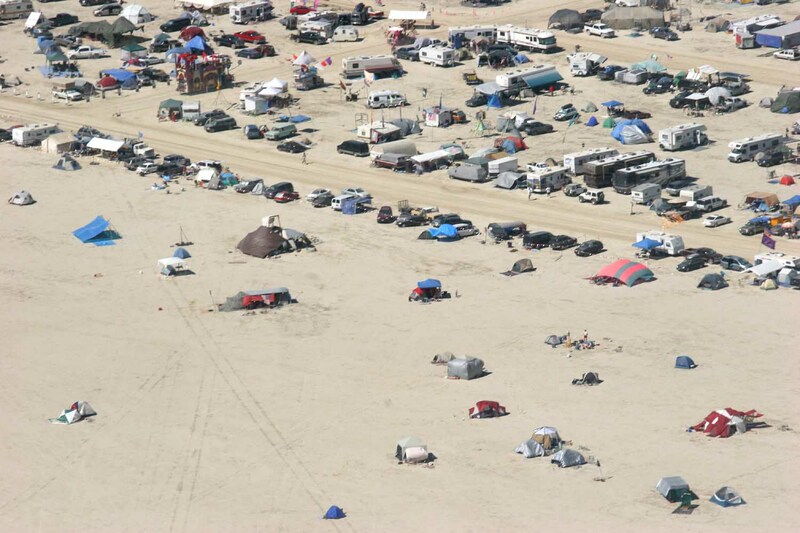 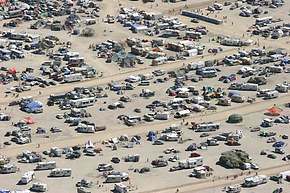 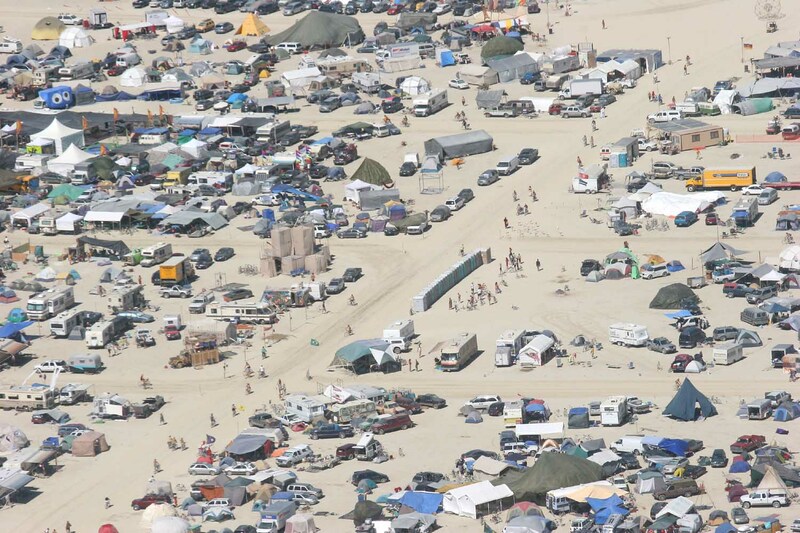 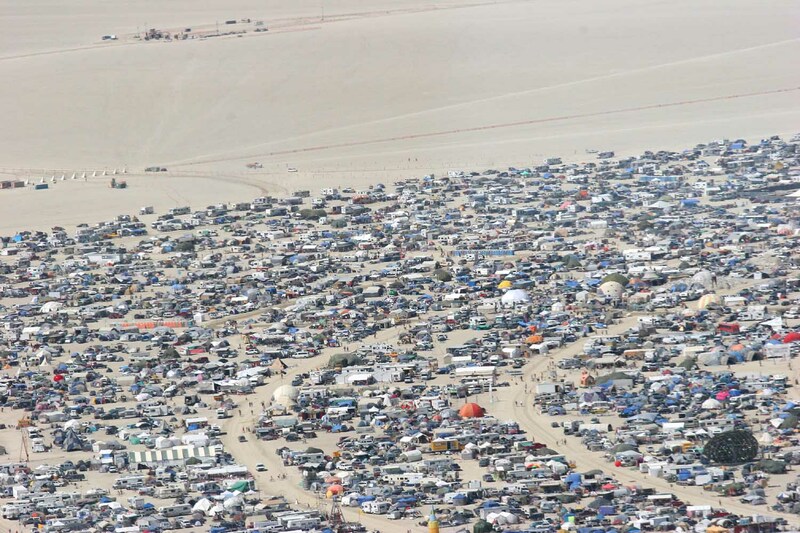 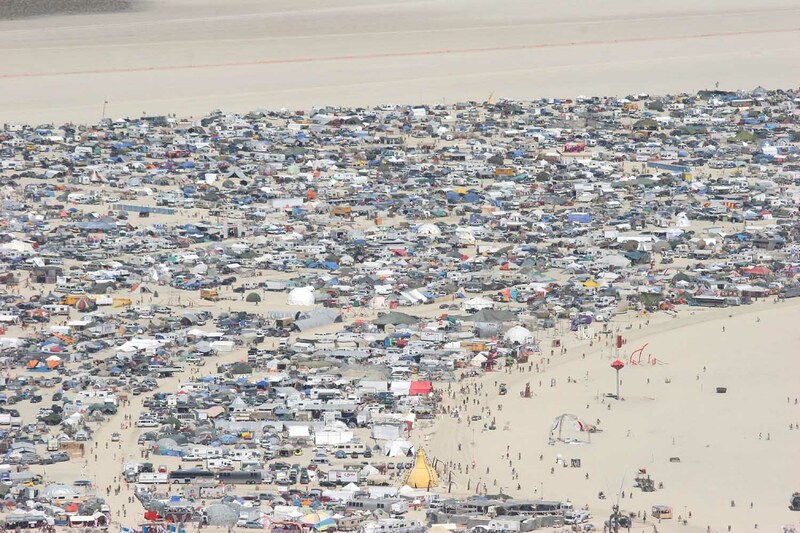 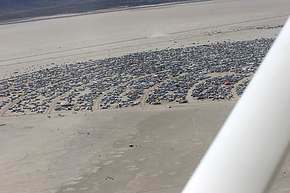 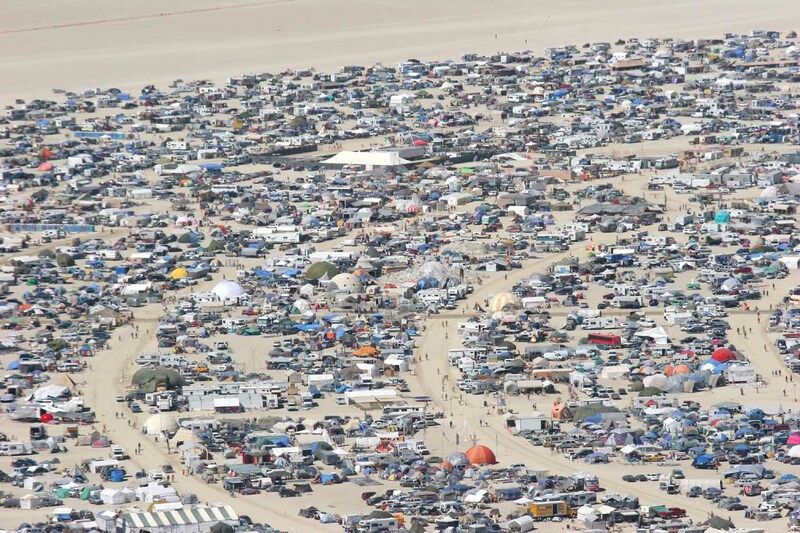 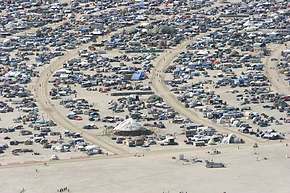 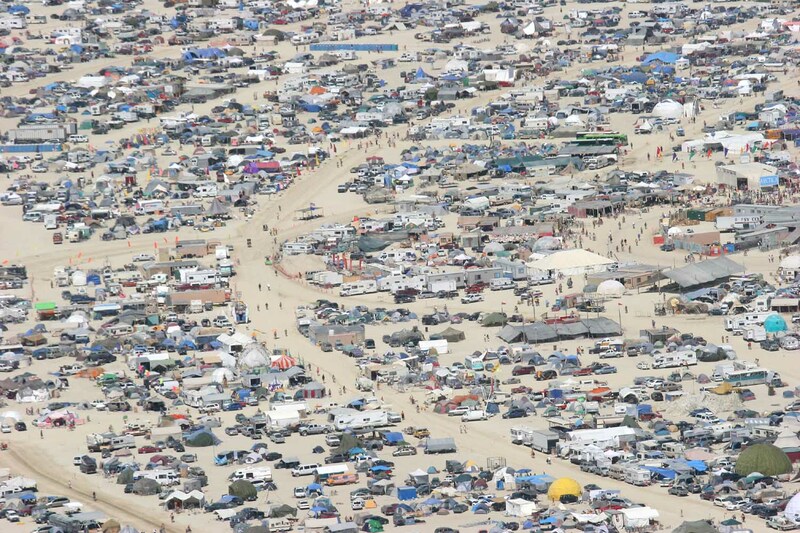 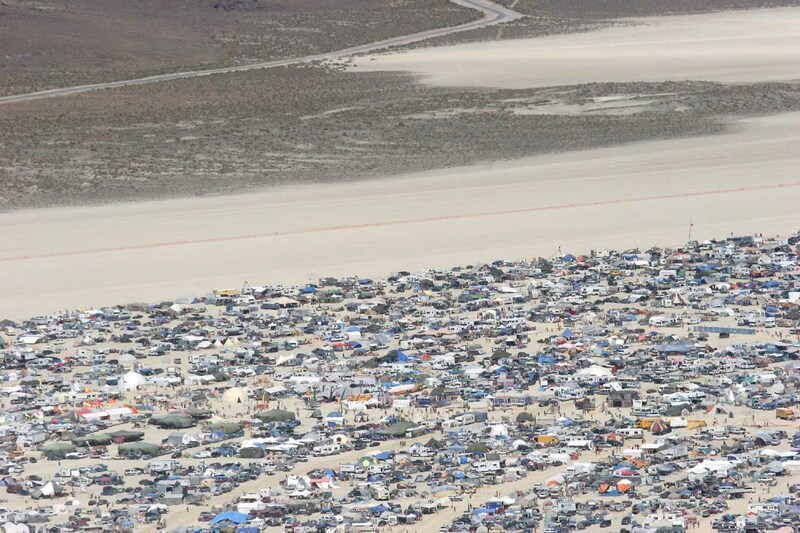 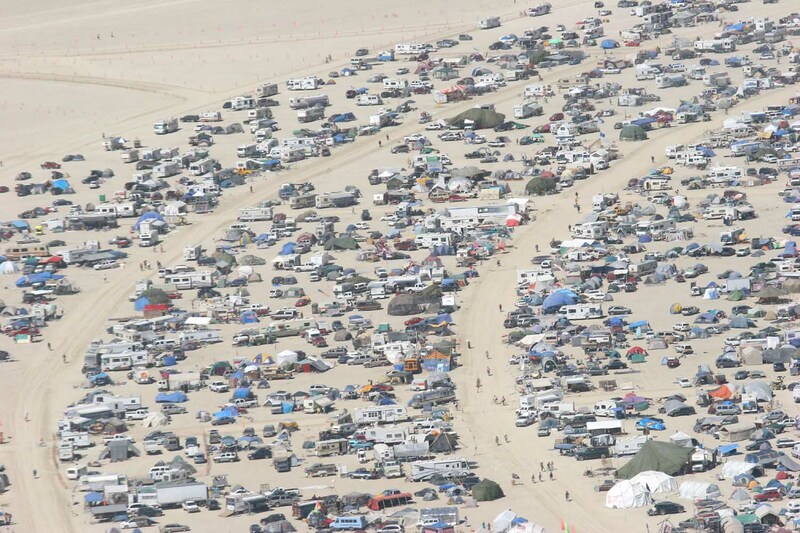 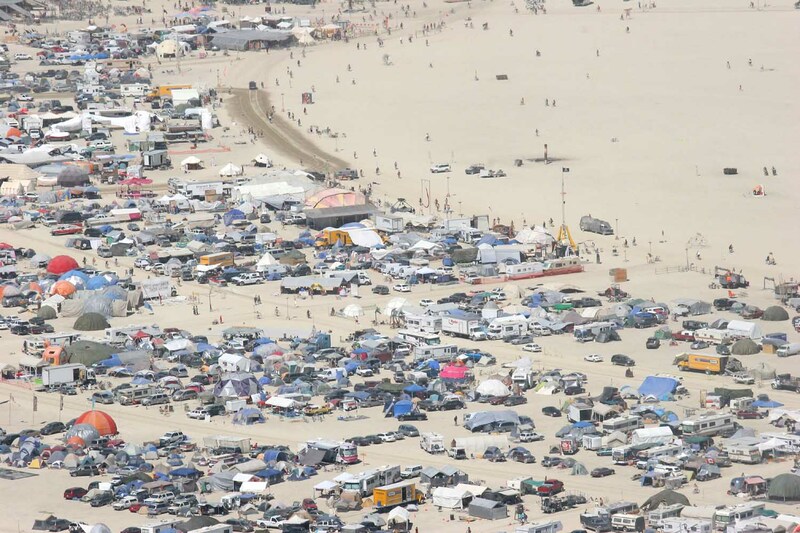 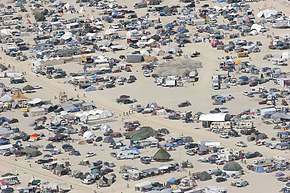 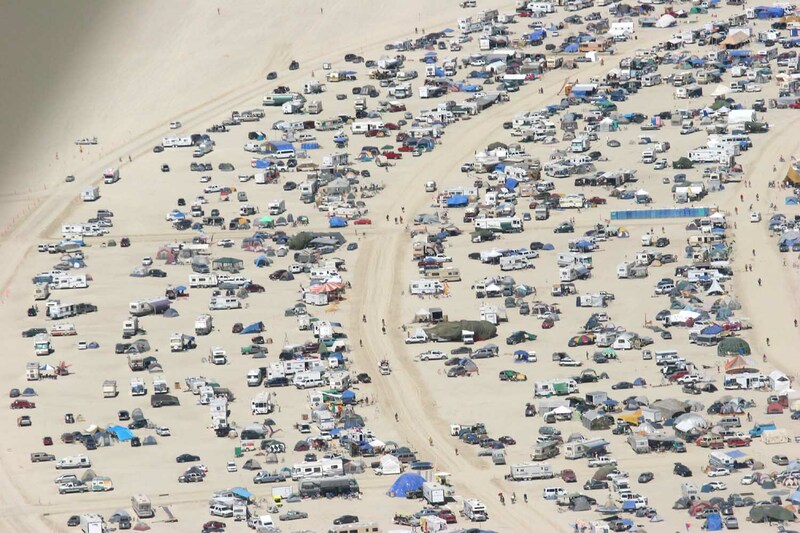 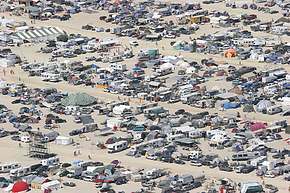 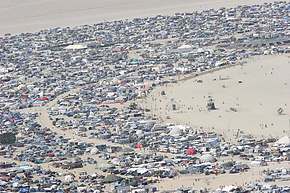 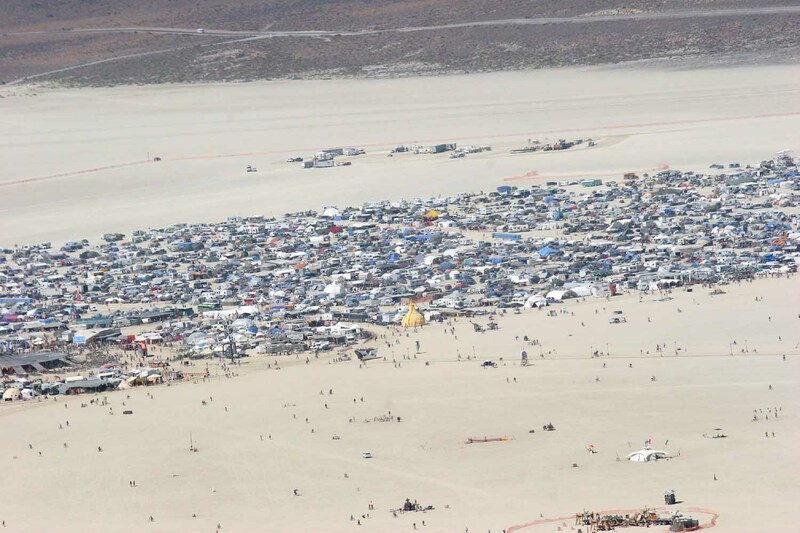 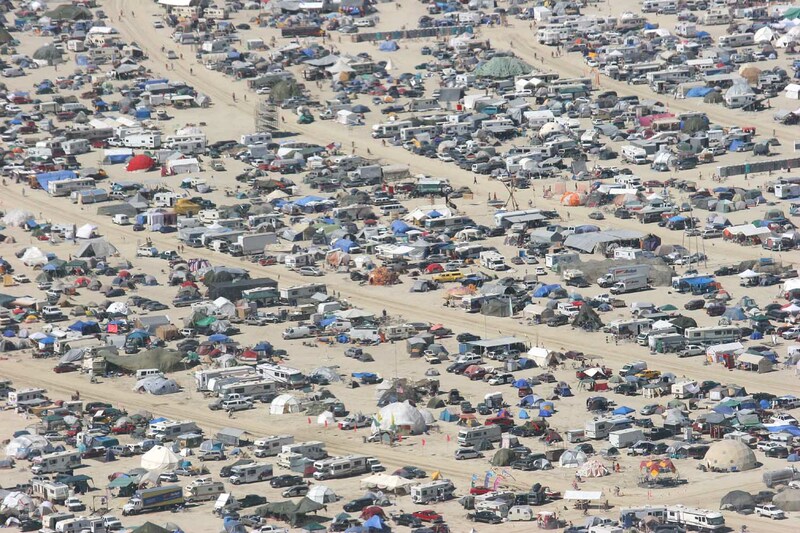 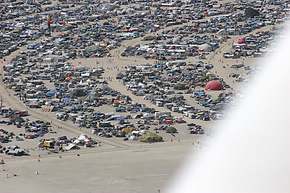 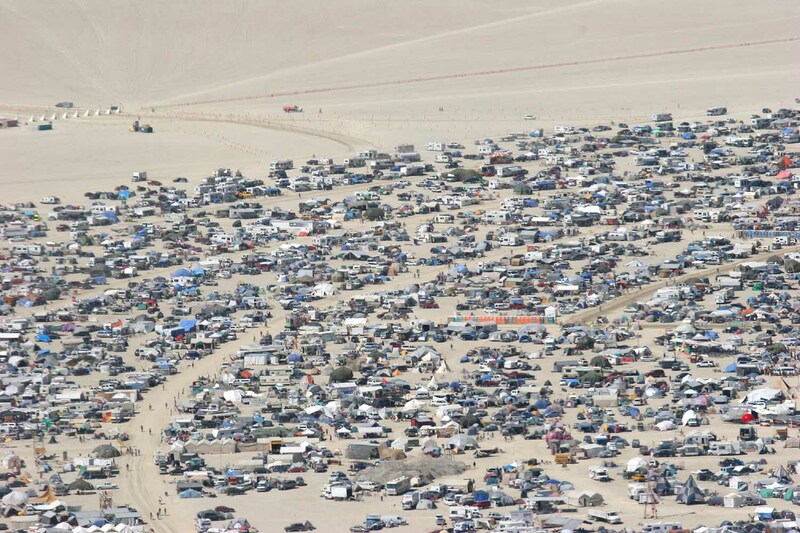 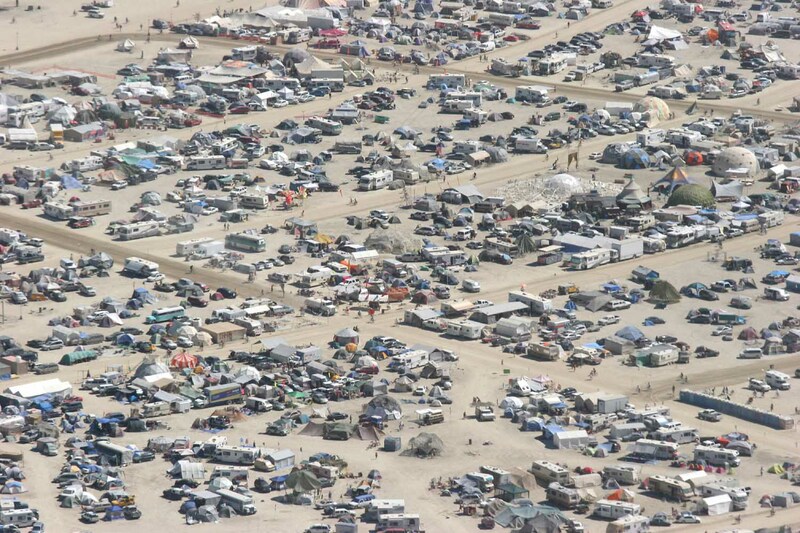 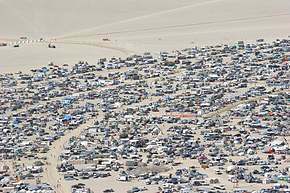 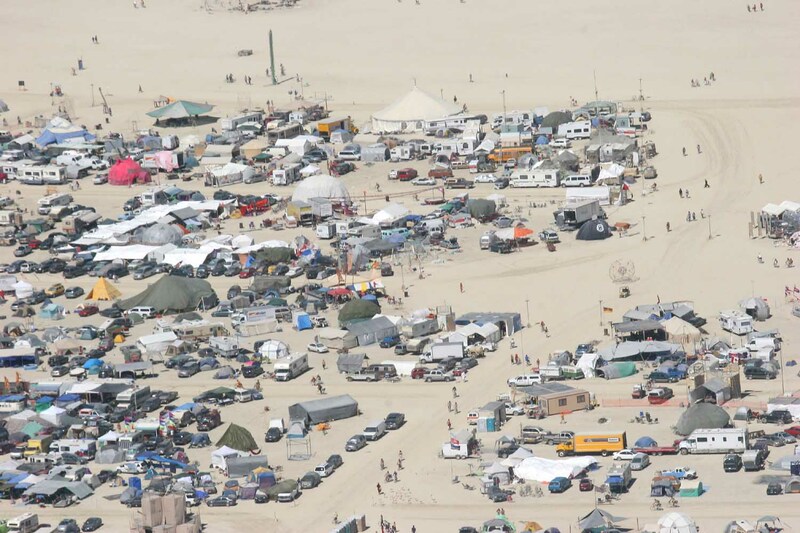 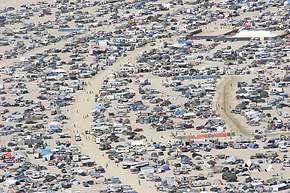 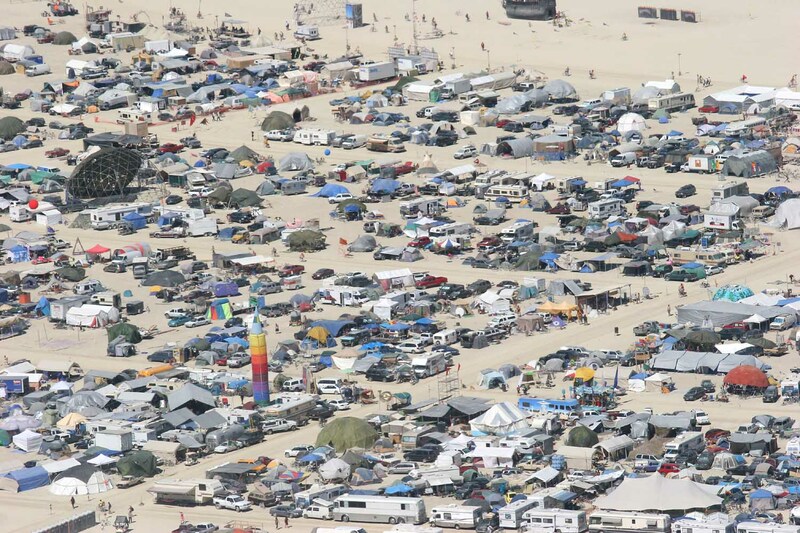 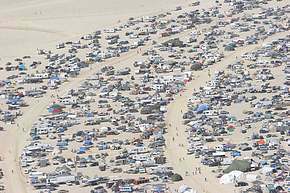 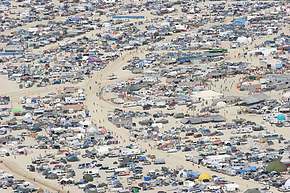 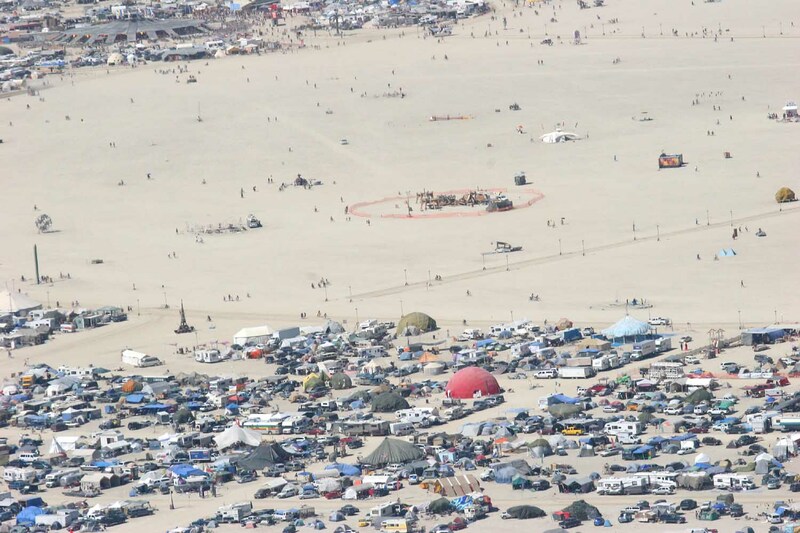 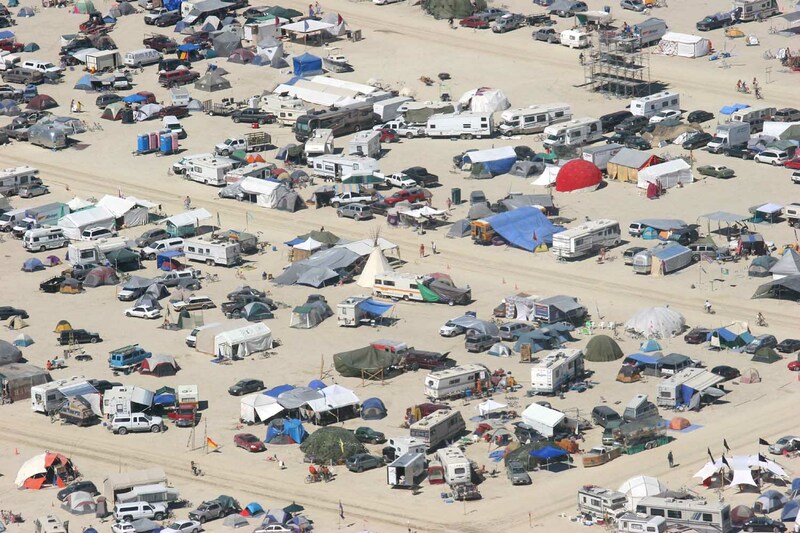 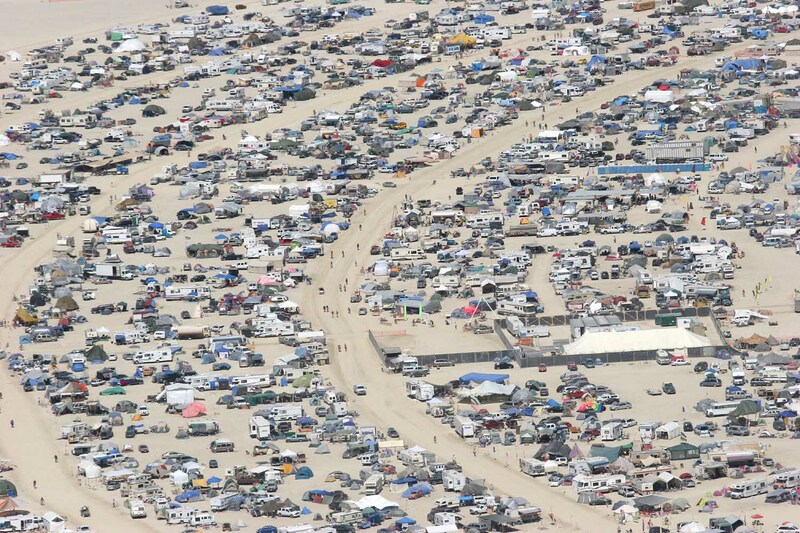 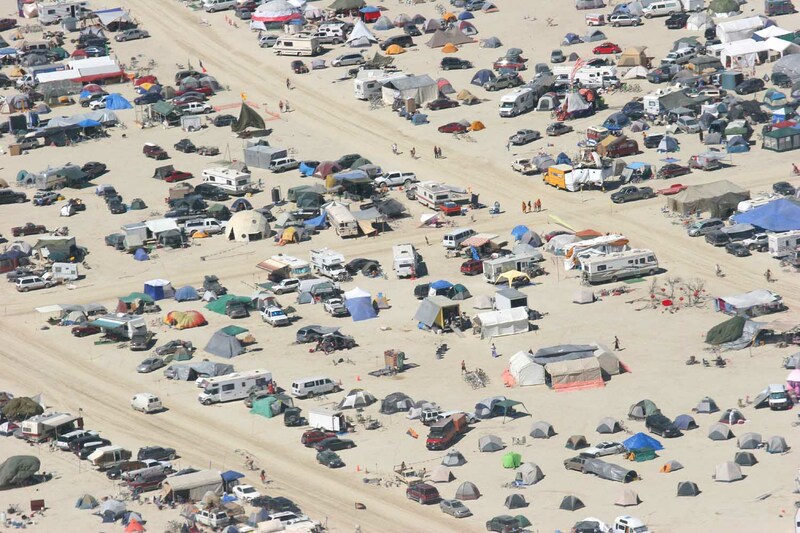 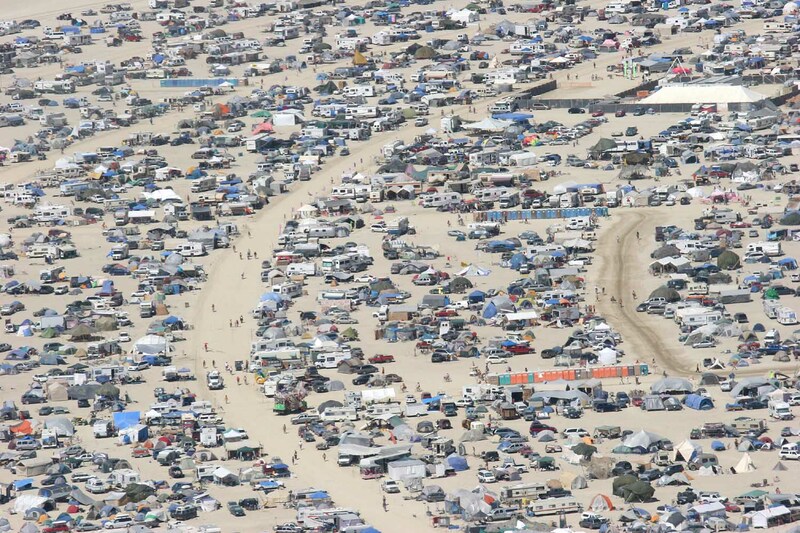 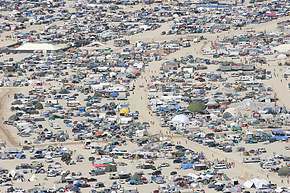 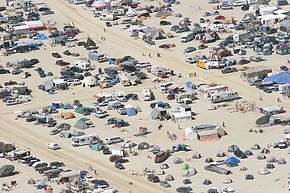 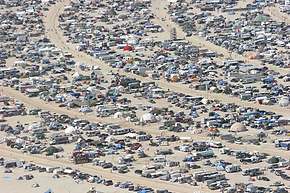 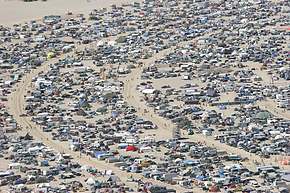 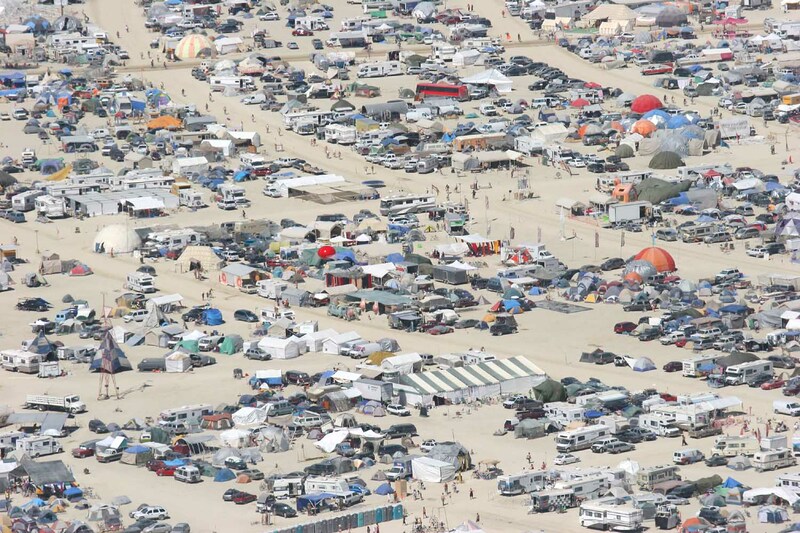 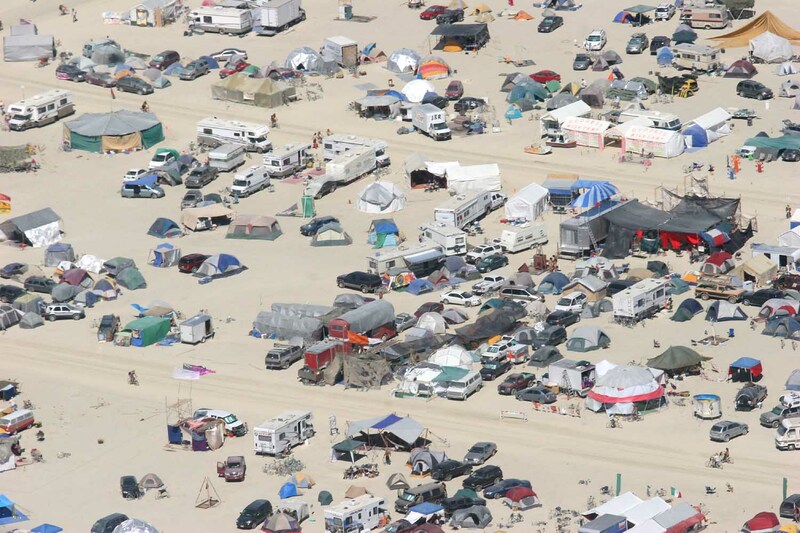 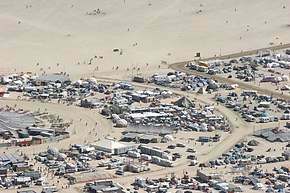 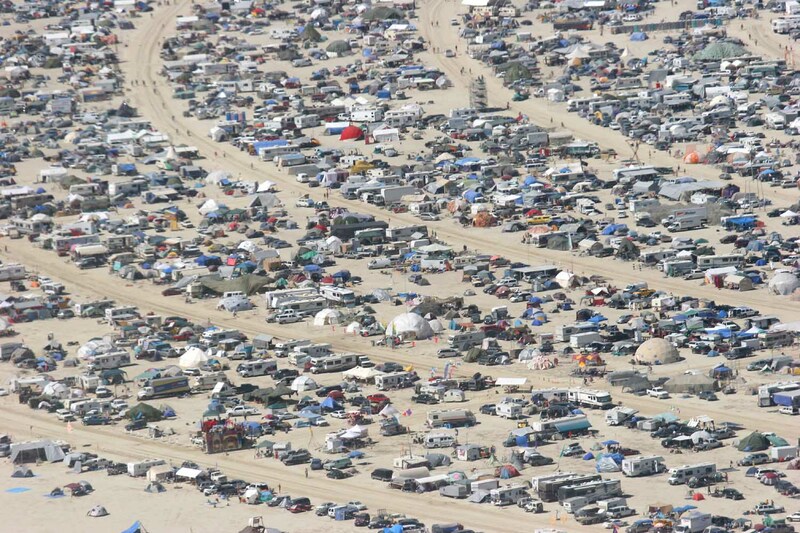 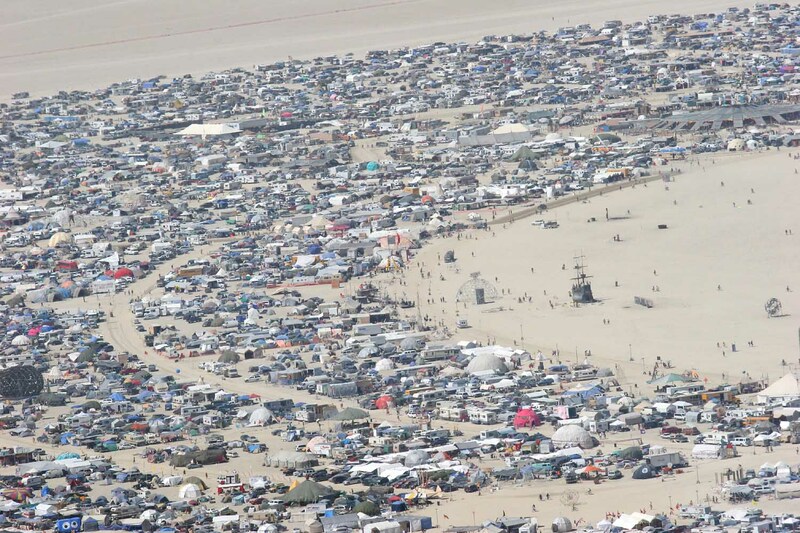 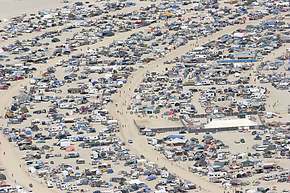 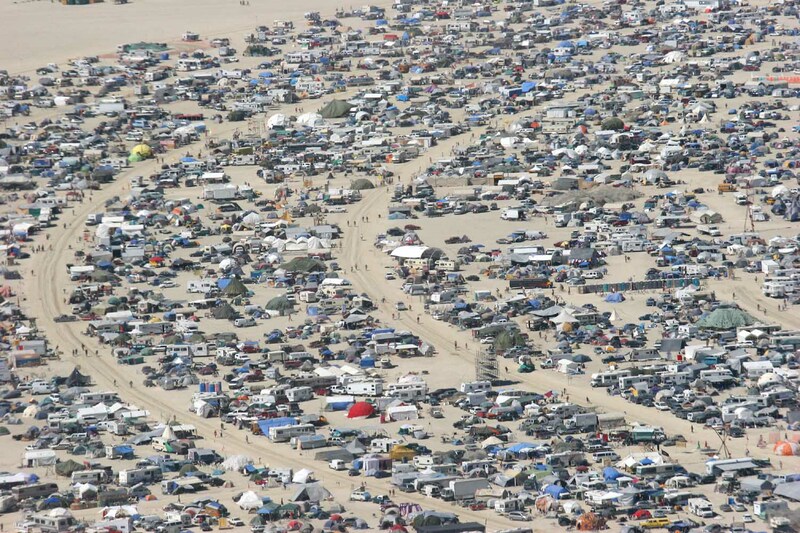 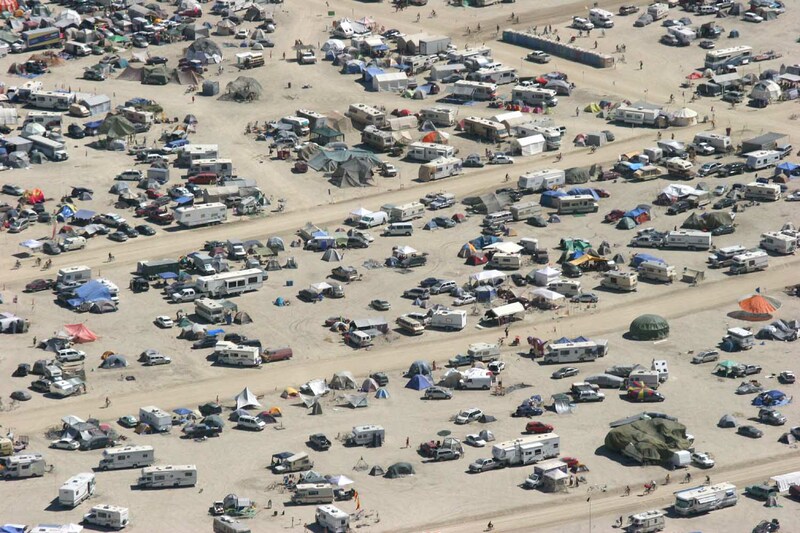 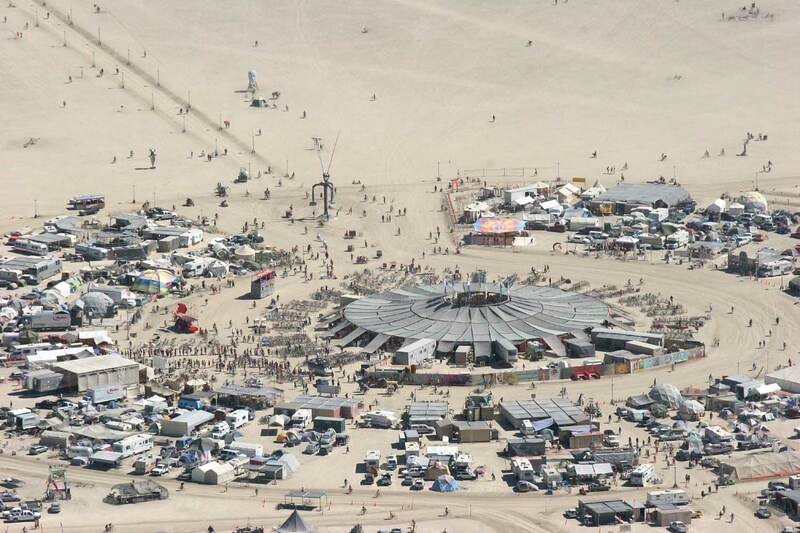 I would love a chance to shoot Burning Man from a plane with an open window some year. Let me know if you're willing to help! 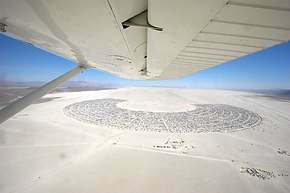 We did two passes around the city, clockwise, starting at about 7pm. The photos are in rough chronological order, so unidentified photos will be near other identified ones. 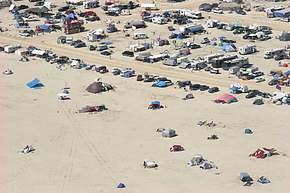 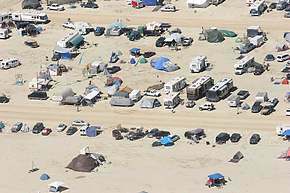 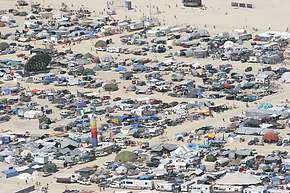 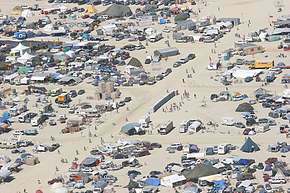 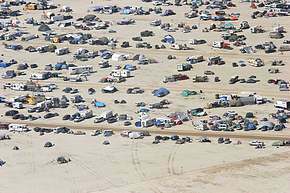 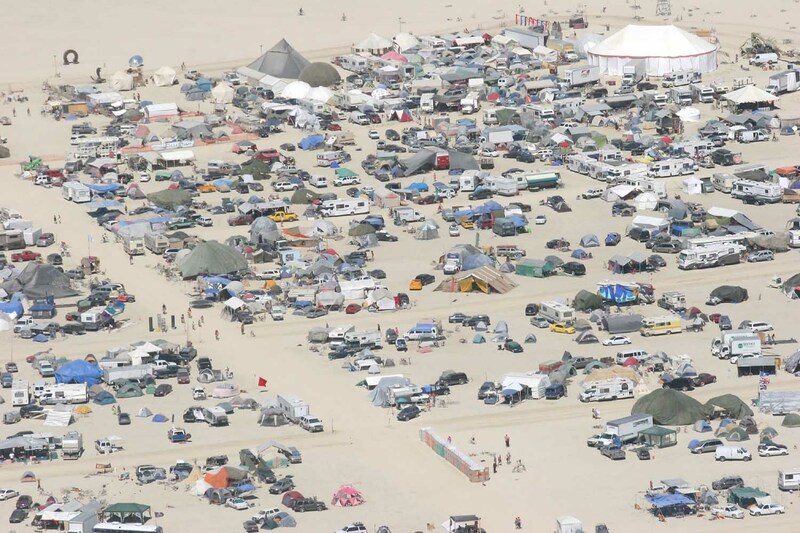 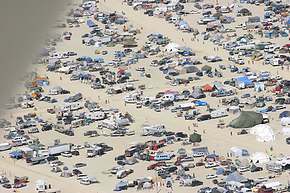 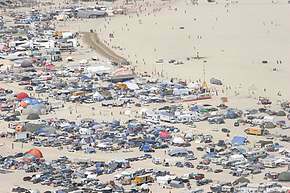 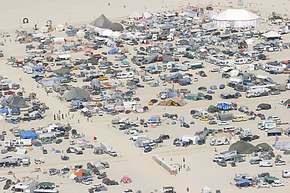 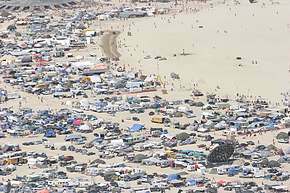 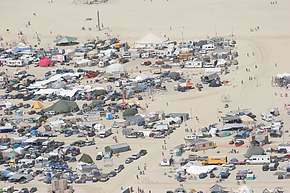 I have left the photos fairly large so you can find your tents, I actually have them 4 times larger in many cases.